NECO industrial water softener condensate polisher systems are the perfect solution for cleaning boiler condensate return water. These stainless steel industrial softeners for condensate polishing are often used in power generation, co-generation plants and several heavy industries with large boiler systems. Industrial water condensate polishing systems remove impurities such as calcium, magnesium, iron and copper, which results in improved boiler feed water quality reducing energy consumption, water consumption and costs. Industrial softener condensate polishers result in lower operating costs. Standard capacity ranges from 150,000 grains to 5,400,000 grains per tank with continuous flow rates from 0 to 1,200 GPM (gallons per minute). 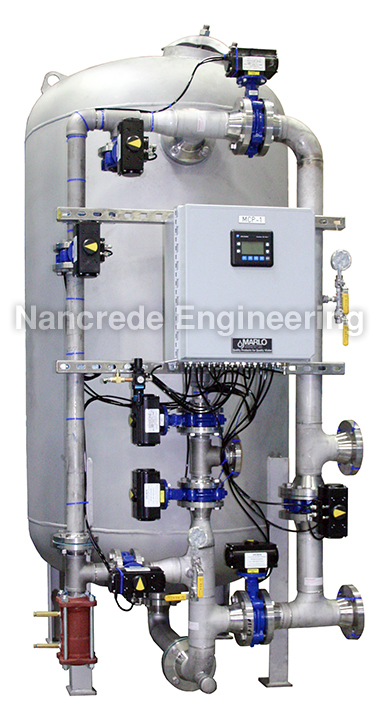 Nancrede Engineering offers specially engineered systems that can be designed to meet the exacting needs of our clients. Our Industrial condensate polishers may also have anion resin to remove negatively charged ions. These polishing systems systems use a mixed bed design. This system uses both cation and anion resins. These systems are called deep bed systems and use strong acid and strong base bead resins to produce a very high quality demineralized water. Our industrial condensate polishers use hydraulic or pneumatic valves, which feature a co-current regeneration sequence. Initially, strong acid cation resin in the sodium (Na +1) form is placed into service. During the sodium cation exchange water softening process, sodium ions are exchanged for undesirable quantities of calcium (Ca +2), magnesium (Mg +2), and iron (Fe +2). Sodium ions already present in the water being softened pass through the process unchanged. Upon exhaustion of the resin (as indicated by unacceptable hardness leakage), a regeneration sequence involving sodium chloride (NaCl) is utilized. Although the water is softened, the total dissolved solids content remains unchanged. Contact us today for world class technical support and service for your industrial water system.